Previously featured on SacHorse.com, the Challenge will feature up to 15 riders in a competition â€œdesigned to showcase the riderâ€™s control, and the horseâ€™s relaxed lightness and responsiveness throughout the course. The challenge is designed to show the versatility of the horse and test the rider to excel in their abilities and to demonstrate their relationship with their horse, horsemanship and equitation.â€ The top 5 finalists will compete on Saturday Evening for the grand prize of a trip for 2 to the Hawaii Horse Expo. The second prize of $500 isnâ€™t too shabby either. If you miss the performance on Saturday Evening, the top 5 finalists will also perform in a short musical freestyle program on Sunday. SacHorse.comâ€™s Mandi Thompson from Mandi Thompson Training will be among the competitors. The Magnificent 7 brings some of the top horsemen from the US and Canada together to demonstrate their skill and versatility in 4 different events: herd work, rein work, steer stopping ,and fence work. 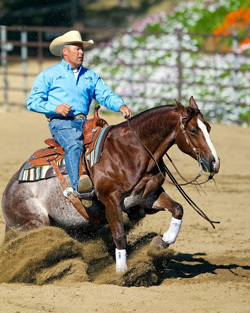 The competition is based on an event called the Worldâ€™s Championship All-Around Stock Horse Contest originally created by legendary horseman Bobby Ingersoll. Big money is at stake as a $25,000 purse will be up for grabs. You can view the horsemen in action on Friday evening beginning at 7 pm. A separate ticket is required for the competition. Tickets for the Magnificent 7 will be $10. Starting on Friday morning, attendees can view the horses for sale and speak with the owners of the horses. The formal preview and demonstrations will begin at 9 am the morning of the Horse Sale. Cattle will be available for use during the demons. The Sale will begin promptly at noon on Sunday, June 15th. If youâ€™re interested in viewing the horses prior to coming to the Expo, please visit: www.DHAuctions.com. For questions about the sale, please call 916-801-9465. There will be tons of clinicians there to help you fix issues with your horse or take your horse to the next level. This year will be headlined by Bob Avila. Mr. Avila has won 37 World Champions/Reserve World Championships and over $1.7 million in events ranging from performance to halter. He is also the first recipient of the American Quarter Horse Association Professional Horseman title, â€œWorldâ€™s Greatest Horseman.â€ Also in attendance will be Gina Miles, Olympic Silver Medalist; Eitan Bech-Halachy, known as the father of Cowboy Dressage; Richard Winters, National Reigning Cow Horse Association World Champion and host of HRTVâ€™s Richard Winters Horsemanship; Richard Shrake, the legendary horseman known for his Resistance FreeÂ® training and riding method; Tim Kumara, a.k.a. â€œMan of Trail,â€ renowned trail course designer; Troy Compton, World and Congress Champion in Western Pleasure, and many, many more. As Ron Popeil would say, â€œThatâ€™s not all!â€ There will be a University area where attendees will learn everything from an education on equine physiology to tips on nutrition, saddle fitting, and barn design. Up Close and Personal sessions will offer attendees question and answer sessions with their favorite clinicians. There will also be a Trail Symposium, Young Rider Park, Draft Horses, Breed Revelation, Book Corral as well as over 400 Exhibitors for trucks, trailers, feed, barns, and everything in between and all around. The Western States Horse & Ranch Exposition expects as many as 50,000 visitors through the turnstiles this year. If you plan on being one of the attendees, tickets will cost $18 per day or you can purchase a 3-day pass for $45. Youth 7-13 will be $5 per day and children 6 and under will be free. The Expo runs from Friday, June 13th to Sunday, June 15th. Gates open at 9 am and the Expo closes at 6 pm, however, the Magnificent 7 and Ultimate Super Horse Challenge will be on Friday and Saturday evenings, respectively. The Expo will be held at Cal Expo Fairgrounds at 1600 Exposition Blvd. in Sacramento. A map to the venue is below. Parking for Cal Expo is $10. For more information, please visit the Horse Expoâ€™s home on the web at www.horsexpo.com.